Gildabrook Cottage Self-cateringLocated at the heart of village life in old Bowness, a conservation area close to the attractive 'Hole Int Wall' and other popular and busy pubs, this well presented cottage is just a two minute stroll from the lake. Days out in the area are numerous with easy walks to the fells at the back of Bowness and by ferry to the west shore of Windermere or up the lake to Waterhead for Ambleside. Bowness offers good shopping with restaurants to cater for all tastes and age groups. Mountain bikes, rowing boats and sailing dinghies can be hired locally. 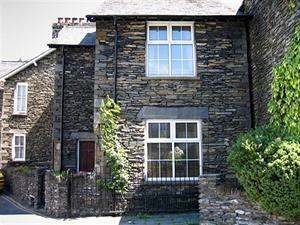 This is an ideal location for Lakeland activities, and with no need to use the car for evening entertainment. Accommodation: Hallway where you can hang your coats. Comfortable sitting room (Smart TV with freesat, DVD, log effect stove and free wi-fi). Good sized separate dining room (stereo CD/radio/cassette player. Small selection of walking guides and maps). Newly fitted well equipped kitchen . Upstairs are three bedrooms - a good sized twin room with a picturesque outlook over Robinson Place, a double bedded room to the rear and a good sized single room also facing the front of the cottage. New fully tiled wetroom has walk in shower, basin and wc. Furnishings are comfortable, and the property has fitted carpets, double glazing and gas central heating. Outside: Enclosed front patio with garden furniture provided where you could enjoy your glass of wine whilst you watch the world go by. Private parking for one car plus safe storage for bikes with a 'lock-up' stand just outside the front door inside the gate. Bowness centre 200 yards, cafes and pubs immediately to hand. Located at the heart of village life in old Bowness, a conservation area close to the attractive 'Hole Int Wall', this well presented cottage is just a two minute stroll from the lake for lake cruises and boat hire. Gildabrook Cottage offers weekly bookings starting on Friday.